Hector's family was warned of possible gang involvement and of his being sent to a continuation school if his destructive behaviors persisted. 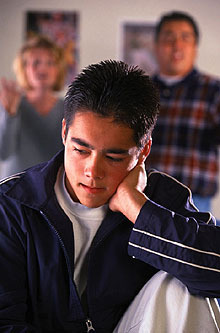 Unfortunately, attempts by his concerned family to help Hector met with little success-until a school counselor suggested they consult with Palabra. Palabra, a 2011-12 Women's Fund grantee, is dedicated to interrupting the cycle of crime and violence for youth who are or might become involved with the juvenile justice system by helping them to develop positive alternatives-pro-social values, interpersonal skills and career placement. With Women's Fund support, Palabra intervened to change Hector's life. He started intensive counseling and after two months, he felt secure enough to finally open up about his dad and brother and to confess the guilt he experienced from their deaths. Feeling angry and powerless, he had responded by becoming the perpetrator of violence instead of the victim. Along with thrice-weekly sessions, Palabra counselors used their restorative justice training to bring Hector together with some of his victims. He was able to realize how his actions were causing in others the same feelings he battled every day. Now 16, Hector attends counseling with his guardian aunt and uncle and is experiencing better relationships at both home and school. His high school performance has so improved that he's back on track to graduate. Moreover, Hector now knows where he's heading and that he has the support to help reach that positive future. Sadly, Hector's story is not unique. The World Health Organization reports that youth violence has a serious, often lifelong, impact on a person's psychological and social functioning. Research suggests that early exposure to violence-either witnessing violence or physical abuse-increases the risk of violent behavior during adolescence by as much as 40 percent. It is not just a problem for the poor, or minorities, or those living in large metropolitan areas. Nor is it limited by class, race, gender or residence. Violence is a form of power, and, tragically, for some youth that experience poor, violent, fear-inducing environments, it is the only form of power available. Thanks to effective programs such as Palabra's, youth who experience challenging environments are being helped to become more resilient as they learn more positive ways to express themselves. To minimize youth-on-youth violence and their Involvement in the justice system.